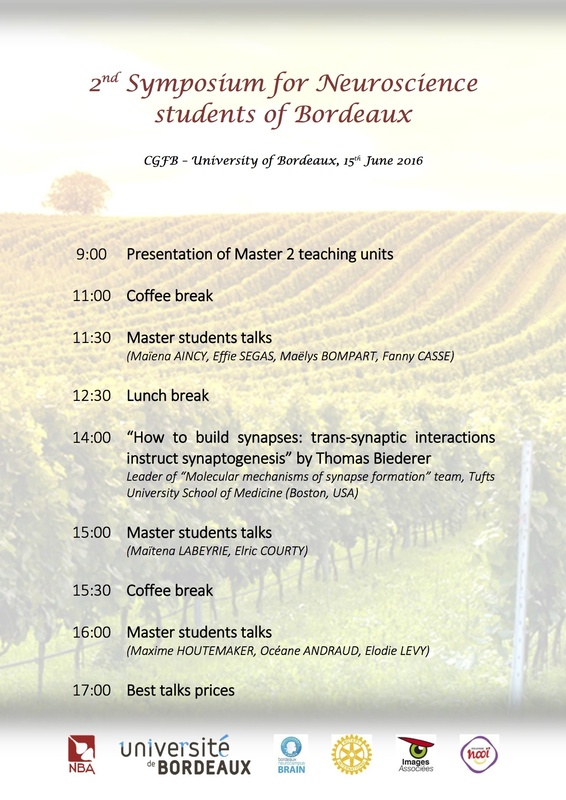 Master students in Neuroscience in Bordeaux have presented their internship research work during the 2nd NBA symposium. AS last year, each talk lasted for 10-15 minutes, followed by questions from the audience and from the jury composed of PhD student coming from all neuroscience Bordeaux institutes. This high quality day allowed participants to get an official abstract and an official oral présentation, and for the 2 best talks to get prizes. This year, we get the pleasure to have in early afternoon a high communication given by Thomas Biederer. Moreover, the end of school year buffet was an opportunity to share good times with professors, researchers and with neuroscientists artists such as Alicia Lefebvre (http://emotionsyn.com).